I'm a day behind after yesterday's early evening. I went to sleep immediately after we finished dinner at 8pm. Sadly, Jessica flew home this morning with 2 other wives (this was part of the plan) so I'm flying solo now with the other 53 people in our group. I was way more sad that she was leaving than I was anticipating. I'm glad she was here for at least part of the experience, but now I wish she would have stayed. So Day 5 we did quite a bit, I'll hit some highlights. 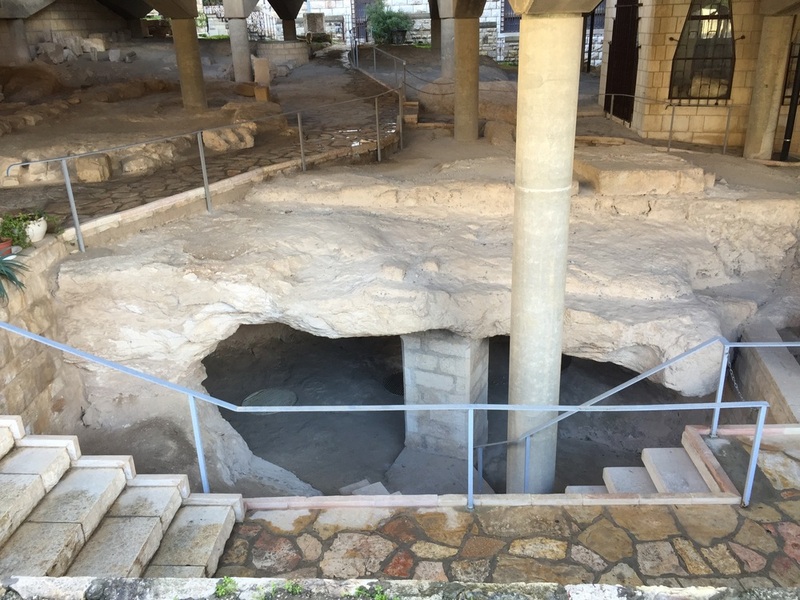 We went to one of the cities of the Decapolis, these 10 cities were all very greek/roman and were not Jewish, so Jesus and other jewish folks of the day would have avoided them like the plague. I'm blanking on the name of this particular city this moment and I'm in a coffee shop with good wifi but not near my notes so I'm going to go with Scythopolis. There is a huge excavation of this entire city that was very focused on commerce and entertainment, because the Romans figured out that the way to keep people happy was to entertain them. Sound familiar? They had public toilets and below is a picture of a bunch of our staff reenacting the scene of public toilets, thankfully they are no longer in use. From there we went to Nazareth, the childhood home of Jesus and the location that Mary received her vision from the angel about Jesus forthcoming birth. Below is a picture of what could have been Jesus childhood home. Whether it was or not He certainly lived within a stones throw of this location because the ancient town of Nazareth was not much bigger than a couple of football fields. In the first century the population was only about 600 people, now its quite developed and about 80,000 people live there. Crazy to think that the boy Jesus grew up here. The town is on a ridge overlooking a well travelled valley where the end of the world may happen. This is the church that is built over the ruins of the small town Nazareth. It's very well done with mosaics from around the world. Not too far from Nazareth is the ancient city of Cana which literally no longer exists. It was destroyed in 66AD by the Romans and never rebuilt. We just "happened" to see a rainbow singing over the former town in the picture below. If you look at the base of the mountain behind the rainbow that is where Cana was located. If you aren't familiar with Cana, it is the location of the scene in John 2 where Jesus turned a large amount of water into wine during a wedding. Classic story that we YL leaders are very familiar with so it's fun to see this location. Another fun fact, there are 2 different families with us that have daughters named Cana, so the rainbow showing up at this time was a nice touch. Thanks Jesus! What we did the next day is so mind blowing I had to make a separate post. Get ready for some seriously, insanely cool stuff!!!!! It's Daylight Saving Time, not Savings!!!!! Before you give up something for Lent, read this. Are middle-aged people just like high school kids?